Nelson Sharpe was born in Northumberland County, Ontario, Canada, on August 25, 1858, and received his elementary education in the public schools of that province. His formal education continued when he entered Albert College, Belleville, Ontario. Nature endowed him with a strong, well-balanced mind in a strong body. His real education, however, commenced when, at the age of 24, he moved to the little town of West Branch, Michigan, among the pine forests of Ogemaw County. There, in partnership with his brother Albert, he published a newspaper and practiced law. He became an American citizen in 1888. In 1893, the Thirty-Fourth Judicial Circuit, consisting of six counties, was created by an act of the legislature. Governor John Rich appointed Sharpe to be the first Judge of this vast circuit. He was an outstanding trial judge for many years. In fact, he attained such eminence that without political influence he was selected for the Michigan Supreme Court on merit alone. He began service in 1919, filling the vacancy left by Russell Ostrander. 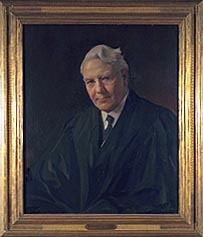 Sharpe served for 26 years as Circuit Judge of the Thirty-Fourth Judicial Circuit, and for 16 years as a Justice in the Michigan Supreme Court. Nelson Sharpe died on October 20, 1935.